In months which have a fifth Sunday, several Sunday School classes gather in the fellowship hall for a time of intergenerational sharing. We share breakfast, prepared by members of one of the host classes and then a short devotional presented by a member of another Sunday School class. You are welcome to join us whether you routinely attend any particular class or no class at all. 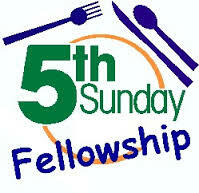 It is a good way to have a chance to meet many in our church you might not have an opportunity to meet otherwise. The children's department also will have a breakfast in the gathering room on the top floor of the education building on these Sundays.